camera (ABC News) Former Obama White House Green Jobs Adviser and co-host of CNN's "Crossfire" Van Jones; former Bush White House Press Secretary Dana Perino, a Fox News contributor and co-host of Fox News Channel's "The Five"; ABC News' Cokie Roberts; ABC News Political Analyst and Special Correspondent Matthew Dowd; and ABC News Chief White House Correspondent Jonathan Karl. A rush transcript of "This Week with George Stephanopoulos" airing on Sunday morning, July 21, 2013 on ABC News is below. This copy may not be in its final form and may be updated. STEPHANOPOULOS: The president gets personal. BARACK OBAMA, PRESIDENT OF THE UNITED STATES: Trayvon Martin could have been me. STEPHANOPOULOS: On crime, prejudice, justice, and community. OBAMA: I think it's going to be important for all of us to do some soul searching. STEPHANOPOULOS: This morning, a special conversation right here on race in America. RICK SNYDER, GOVERNOR OF MICHIGAN: The city is basically broke. STEPHANOPOULOS: After Detroit goes bankrupt, can the Motor City move from crisis to comeback? Plus, it's never too early. SEN. TED CRUZ, (R) TEXAS: Today is the first time I've been to Iowa. STEPHANOPOULOS: This Tea Party Texan, a freshman senator, sure looks like he's running for president already. CRUZ: Let's stand up, stand for principles, stand for the constitution. STEPHANOPOULOS: We're on the trail in Iowa with Ted Cruz. All of that and the powerhouse roundtable this Sunday morning. STEPHANOPOULOS: It came by surprise on a sleepy hot summer Friday, America's first black president slipping into the briefing room for his most personal speech yet on race. No teleprompter, few notes. As the debate over Trayvon Martin's death roiled the country, the president told aides he would speak from the heart on being a black man in America. OBAMA: There are very few African-American men in this country who haven't had the experience of being followed when they were shopping in a department store. That includes me. There are very few African-American men who haven't had the experience of walking across the street and hearing the locks click on the doors of cars. That happened to me, at least before I was a senator. STEPHANOPOULOS: A remarkable admission sparked by divisive questions. Did Trayvon Martin die because he was black? Was George Zimmerman acquitted because he is not? OBAMA: And that all contributes, I think, to a sense that if a white male teen was involved in the same kind of scenario, that from top to bottom, both the outcome and the aftermath might have been different. I just ask people to consider, if Trayvon Martin was of age and armed, could he have stood his ground on that sidewalk? STEPHANOPOULOS: The president then reflected on what all of us can do to bridge our differences, closing with a father's pride. OBAMA: When I talk to Malia and Sasha, and I listen to their friends, they're better than we are. STEPHANOPOULOS: And a president's hope. OBAMA: We're becoming a more perfect union, not a perfect union, but a more perfect union. STEPHANOPOULOS: In our program today, we'll continue the conversation the president sparked on Friday. And we begin with This Week's headline from what's been called America's most racially polarized city. Detroit declared bankruptcy, Thursday, the largest American city ever to do so. And we're joined now by the mayor of Detroit, Dave Bing. And Mayor Bing, I know you resisted this bankruptcy option, but are you convinced now that it's going to bring a new start to the people of Detroit? BING: Well, I'm surely hoping that this will be a new start. Detroiters are a very, very resilient people. And we have a, you know, when we had Chrysler and General Motors that the federal government helped in their bankruptcy, they came back and they are doing well. Detroit is a very iconic city, worldwide, and our people will fight for this. And we will come back. STEPHANOPOULOS: The auto industry came back with federal help, but Vice President Biden says we don't know, yet, how the federal government can help Detroit. I know you have been in contact with White House officials, with administration officials, have you asked for federal assistance and what have they told you? BING: Well, I think it's very difficult right now to ask directly for support. I have gotten great support from this administration. I've got great support from a lot of the different departments within the administration. They have been helpful, but now that we've done our bankruptcy filing, I think we've got to take a step back and see what's next. There's a lot of conversation, a lot of planning, a lot of negotiations that will go into fixing our city. STEPHANOPOULOS: So no federal bailout? You know, I know the president has a lot on his plate. This is going to add tremendously to that. And I want to say, we're not the only city that's going to struggle through what we're going through. There are over a hundred major urban cities that are having the same problems we're having. We may be one of the first. We are the largest, but we absolutely will not be the last. And so we have got to set a bench mark in terms how to fix our cities and come back from this tragedy. STEPHANOPOULOS: And I know you have to help yourselves first, but, you know, Steven Rattner, who ran the federal bailout, the auto bailout for President Obama wrote in The New York Times yesterday, he said that the president should go through every federal programs and find out what can be done for the people of Detroit. He thinks it's justified. Isn't there anything the federal government can do? BING: Well, I do think -- once again that I've had some conversation already, I'll be more specific in the days and weeks ahead. I'm not sure exactly what to ask for. I mean, money is going help, no doubt about that, but how much? I mean, there are a lot of things -- we have to have an organized plan so we know that whatever we get is going to be invested where we can maximize the return on the investment and give the people the kind of services that they need, give them the idea that they can live in this city and be safe. They can work in the city, they can educate their kids in this city. That's what this American iconic city is all about. And I think that we will once again be foremost in what's happening in our city in terms of coming back. STEPHANOPOULOS: As you know, a judge has now stepped in, a county judge has stepped in and said this bankruptcy - filing bankruptcy violates the Michigan constitution. Do you agree with that? Are there any other alternatives out there? BING: Well, I'm not a lawyer. And I'm glad I'm not at this point in time, but I'm hearing -- I am hearing that, you know, that the federal constitution will trump the state constitution. So I do believe that. But whatever happens, we can't allow lawyers to dictate what's going to happen in our city and its comeback. We've got to throw away a lot of the bickering and fighting amongst us and do what's best to bring cities like Detroit back. STEPHANOPOULOS: And we know that's going to be a difficult process going forward. And it comes against the backdrop - we saw the president's comments on race on Friday. Over the last 50 years, Detroit has gone from more than 80 percent white to more than 80 percent black city. And Keith Richberg, an African-American reporter from the Washington Post points out Detroit is one of the most racially polarized cities in America. And he adds this, he says, "older Detroiters are correct that the city was surrounded by a ring of often hostile white suburbs in a largely conservative state that had little time for a poor, destitute, Democratic and black city. The governor's appointment of an emergency financial manager is again seen as a hostile racist takeover by the state over the city's elected black leadership." BING: Well, I don't want to make this a black and white issue. It's a financial issue. And it's green. We've got to get some funding that's necessary to help us fix our problem right now. I don't want to stir the pot and bring up all kinds of historically racial issues. We have got to get beyond that. You know, the polarization between our city and our suburbs is something that's been going on for the last 60 years. We have got to change it. Once again, if Detroit fails, doesn't make it, then all of these surrounding suburbs are going to feel the brunt of it also. So it behooves us to see how we can work together to make this entire southeastern region livable for all of us. STEPHANOPOULOS: What does a new Detroit look like after bankruptcy?? BING: Well, I think what's happening now is our downtown is really hot. It's coming back. Our midtown is really hot. And it's on its way back. Our biggest problem is in our neighborhoods where most of our people are living. We've got to make sure that those people understand that we care about them. That we're going to reinvest in our neighborhoods and give them the things that they need. The services have been horrendous for a long time, because of the lack of resources. And I mean, money and in some cases leadership from a people and personnel standpoint. But I think our city is going to come back. It's not going to happen overnight. And we've got to be very strategic in whatever we do that we can't fix it all overnight. People need to understand that. We've got to better communicate that to people and let them know that the Calvary is coming. Nobody is going to deny them their rights. And it's a tough situation, but once again Detroit is resilient. We will come through this. STEPHANOPOULOS: And we are all rooting for you. Mayor Bing, thanks very much. BING: Thank you so much, George. 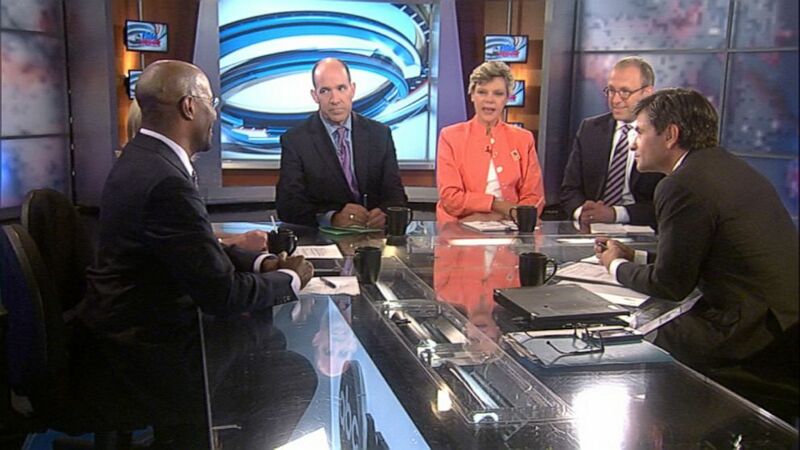 STEPHANOPOULOS: Let's bring in the roundtable now. From our ABC team, Matthew Dowd, Cokie Roberts and Pierre Thomas along with former Obama adviser Van Jones, now with Crossfire on CNN, and former Bush White House press secretary Dana Perino from the Five on Fox News. And I want to talk about Detroit in a minute, but first let's begin with the president's speech on Friday. Remarkable. And Matthew Dowd, quite different from the president's past speeches on race, the few that he's give where he presented himself more as a bridge between white and black. Here, he explicitly, you know, to coin a phrase, stood his ground, spoke as a black man to the rest of America. MATTHEW DOWD, ABC NEWS CORRESPONDENT: I think it was a very telling speech, actually. I watch people in public life a lot and people in private life, and sometimes they give - they have a conversation in order to inform somebody. And sometimes they're having a conversation out loud with themselves. I thought a big part of his speech was something that he's been dealing with over the course of his years in public life trying to grasp with where he is in all of this process. Obviously, he wanted to communicate. One of the things that I thought was a beautiful line in the speech said, "if you want to honor Trayvon Martin, then violence isn't the way to honor him." So I thought he wanted to quell some of that and put that. STEPHANOPOULOS: He doesn't have to run away from race anymore. But Van Jones, some of the president's critics in the African-American community, including Tavis Smiley, Cornel West and others, say it's too little too late; the president hasn't spoken out enough on these issues, hasn't done enough. VAN JONES, FORMER WHITE HOUSE ADVISER: Well, there hasn't been that conversation. First, I think let's applaud the president. He's supposed to be the educator in chief on a lot of these issues. It would have been worse for the country if he had said, well, because I'm black, I can't talk about this. The fact that he was able to come forward and talk about it, I think is a good thing. And public leaders do this all the time. They talk about their background, if they're Irish, if they're Catholic. And also, Jimmy Carter, Bill Clinton, LBJ talked about race from a personal point of view, being white Southerners. And so he talked about it, and the republic still stood. That's a good thing. That's a good thing, because people I think were afraid if he talked about it as a black man, we would all fall apart. We didn't. That's a good thing. There's other good things, too. You mentioned violence; there's been none. And not only that, these young people have been speaking out, have been very sophisticated politically. You've got Color of Change, they've got a million people online now that are going to be working to fix "stand your ground" laws across the country in multiple legislatures. That's amazing. The Dream Defenders, a non-violent sit-in protest with the governor's office, no violence. They have their own bill they're putting forward called Trayvon's Law. Positive things are coming out of this, and I think we should celebrate the fact that if the young people had gone out rioting, we'd be talking about them. They're not rioting. They're being sophisticated. We should applaud it. And, Dana, being a relatively muted response from most conservatives to the president's Friday speech. DANA PERINO, FORMER BUSH WHITE HOUSE PRESS SECRETARY: Right. Well, part of that was that it comes on at 2 o'clock on a Friday, and there's reason for that, if you remember. I think that there was a much more practical reason for the speech as well. I agree with on the personal pieces of it. But earlier in the week, Attorney General Eric Holder had suggested at the NAACP meeting that there might be a federal prosecution brought against George Zimmerman on a civil rights charge. With the burden of proof being even higher for the federal government to bring something like that when the state government couldn't meet its burden of proof. It is unlikely that that case, if it had gone forward, would have been able to be successful. So I think what President Obama did practically was on Friday afternoon say I know you're going to get together tomorrow; I am glad that you are. I think that we have got a lot of work to do, but he signaled very strongly there's not going to be a federal case. STEPHANOPOULOS: Both the president and Eric Holder got very personal in their speeches, sort of an -- "feel your pain" speeches. But are those speeches really a substitute, as Dana points out, for pursuing this -- these charges? PIERRE THOMAS, ABC NEWS SR. JUSTICE CORRESPONDENT: They are walking the tight rope. The attorney general talked about how he had to have a conversation with his son after seeing what happened with Trayvon Martin. And 30 years earlier, 40 years earlier, his father had the same conversation with him. STEPHANOPOULOS: Earlier we thought he was going to get it. THOMAS: He's not getting the gun because it's evidence and they want everything on hold. And I will say this, even though it's a long shot, it's a heck of a thing to have the FBI really poring into your background and looking at you in the way that they are going to do over the coming weeks. But again, a long shot. STEPHANOPOULOS: OK, and Cokie, the president probably had to give it for other reasons as well, politically as well. He couldn't be silent. COKIE ROBERTS, ABC NEWS CORRESPONDENT: He couldn't be silent. I mean, that is absolutely right. Look, whatever the evidence was, whatever the legality was of this case, the bottom line is a boy was walking home from the store and ended up dead. And that is what has such outrage in the African-American community. And understandable, why wouldn't you be outraged? This child was killed. And the president really did have to address it. I think his own children probably weighed in. When I was interviewing the first lady in Africa 10 days or so ago, she said, you know, I don't (inaudible) on him, but the kids do. And that is -- that's typical for a politician's family. And so I think that they probably said, Dad, you have to talk about this, it's all anybody at school is talking about. STEPHANOPOULOS: I think you are exactly right. Where does this all go from here? The president was sort of refreshing in saying he didn't want to want to call for this formal conversation because he know what can happen when presidents have done that in the past. He says it gets stilted and awkward. But we are going to have these debates about "stand your ground," whether or not it's actually reduced violence or increased it. UNIDENTIFIED FEMALE: It's the shootout at the OK Corral. DOWD: I think the president understands what the situation that he faced, which is a huge part of the public looks at institutions through their prism of their own belief system. So -- and they -- so he understands that we can't go have a system where six women in a court case, where evidence was presented by both sides, make a decision that somebody is not guilty, and then undermine that, because he's having to deal with that at the federal government level. ROBERTS: And his point about that. Suppose Trayvon Martin was of age and had a gun and felt that he was threatened because he was being followed. You know, and he could have it in the "stand your ground" law. Now, that is part of the conversation. STEPHANOPOULOS: This is where it gets so complicated, Pierre, and I'm going to bring it to you and then Van Jones as well. The evidence is mixed on whether it reduces violence or not. One thing we know for sure is that justifiable homicides have gone up a lot since "stand your ground" laws have come in, and African-Americans are much less likely to have their homicides found justifiable than white Americans. THOMAS: Well, again, through the prism of race, many African-Americans believe that they won't get the benefit of the doubt if they use "stand your ground" on their behalf. And they believe in this case that Trayvon Martin would not have had an opportunity to stand his ground. And, look, you can talk about this all you want. Race permeated that case. And many African-Americans feel like that Trayvon Martin did not get justice. And you can say that the system worked properly, and everyone's talking that way, but you have a significant part of American society, that being the African-American community, that feels like it failed. STEPHANOPOULOS: In this case, (inaudible) problem, Dana Perino, a whole lot of other Americans look at it and say, it worked exactly the way it was supposed to work. PERINO: Well, the other thing is that I think that they have to be careful about is that the FBI has already looked into it. They actually looked into George Zimmerman and they gave a whole report to the state prosecution, saying we can find no instance of any sort of racial undertones of George Zimmerman. And maybe they'll find something else that they turn over more things. I don't know what else they could find. But also I think that there -- when a president speaks, it's to multiple audiences. So from the prism of self-defense, if you think of the young mother whose 2-year-old son was shot in the face by the two black teens that approached her in Atlanta, and that baby has died, why do federal -- why do presidents choose to speak about one case and not the other? That's why it's better maybe to not talk about any of them. They chose to talk about this one. I do think that the president was signaling we're going to have to move on. PERINO: -- good luck on "Stand Your Ground". STEPHANOPOULOS: When it becomes part of the national conversation, it's almost impossible to ignore, though. STEPHANOPOULOS: Against her husband (inaudible). JONES: -- her abusive husband, she fired a bullet into the ceiling. She gets 20 years in jail for firing a shot into a ceiling, whereas somebody who fires a shot into a teenager is still walking the streets a free person. That is a reason for us to look at this. But there's something positive that has not been talked about from the Right. Conservatives have weighed in; they said they are very concerned about the killings in Chicago and in other urban environments. African-American leaders have tended to dismiss that, and say, well, they're just scoring political points against civil rights. They don't mean it. JONES: We could actually come together over this, not come apart. DOWD: Actually which goes, Van, goes to this point of where Detroit is, which is our urban cores of this country -- Detroit is actually the front and center with probably (inaudible) -- in our urban cores, we've become much more homogeneous in our urban cores, where the suburbs are much different than our urban cores, the economy of the urban cores are much different. The money that is able -- available for infrastructure (inaudible). STEPHANOPOULOS: And Detroit was in the vanguard of that. DOWD: And Detroit was definitely in the vanguard of that. I mean, Detroit, 50 years ago, when our family lived there, I mean, my mother and father were raising kids there, was much different as you went up. And then as you drove up Woodward Avenue five miles until you went into Bloomfield Hills and all that. But we do have an urban problem, and we do have a problem in this country where everybody is dividing by many different things. They're dividing by race, they're dividing by income, they're dividing by age, and that has gone on throughout this country. The president understood this when he ran in 2008. I thought the president -- I thought he spoke very well about it. He hasn't done much about it to bridge those divides, he gives a great speech. He hasn't done well. But I totally agree with you. If I were a Republican candidate, if were President of the United States, somebody like Chris Christie or somebody, I would have an urban centered strategy, because if you can improve the urban areas, you are going to improve the economy. STEPHANOPOULOS: Dana Perino, even if you're not going to get urban votes, you'd do it to (inaudible) because you care. PERINO: -- because it's the right thing to do. As we've seen on education, that's the one piece you didn't mention, George W. Bush, when he runs on No Child Left Behind, that wasn't about schools in the suburbs and the rural areas, that was about urban schools and about the soft bigotry of low expectations of African-American and Hispanic students. ROBERTS: But I think it's also -- you talk about we're divided along these lines, but we're less divided than we used to be. And the president talking about his a more -- and a more perfect union. We have intermarriages are doubled -- have in the last 30 years, inter-racial marriages. And the new marriages, it's 15 percent. So you start to see people mingling in ways that was just never the case before. DOWD: But I think we have a huge class -- we have a huge class distinction that's grown and grown and grown. And to me, the Trayvon Martin situation has more to do with class than it has to do with race in my view, because I think what happens in this country, anybody from a lower class -- think about the three women in Ohio that were basically kidnapped, and because they came actually from a different class, nobody really looked for them, nobody really -- and the health care that different classes get is totally different. So I think maybe we're less divided on race in this country, maybe, but our class distinction has become more profound. STEPHANOPOULOS: Pierre, you get the last word. THOMAS: And the country is growing in terms of race relations, but going back to those urban corridors, major cities across the country, there's a group of people that have been largely forgotten. Period. STEPHANOPOULOS: Great discussion. Everyone stick around, we've got a lot more to come. But first, it's never too early. Three days before election day, Texas firebrand Ted Cruz is on the trail in Iowa. We're there. UNIDENTIFIED MALE: What's going on here? Are you running for president? UNIDENTIFIED MALE: I'm going to have to come to Iowa again. UNIDENTIFIED FEMALE: We want to know if you're going to run now. OBAMA: I've got to admit, that right now I'm focused on '06, and we're going to get all these Democrats elected. UNIDENTIFIED FEMALE: That's exactly right, very good. OBAMA: And then, after the election, you know, we're going to then think about '08. STEPHANOPOULOS: Just a little dodge from freshman Senator Barack Obama stumping in Iowa more than two years before election day. Well, we're more than three years from the next election day, but that state where the first votes are cast has already seen all kinds of wannabes. And Jon Karl was there with one of them this week, another freshman senator, Republican Ted Cruz of Texas. JON KARL, ABC NEWS CORRESPONDENT: George, let's just agree that it's an axiom of American politics no out of state senator ends up in Iowa by accident. So, I was surprised as I took that non-stop from Washington to Des Moines, that I saw not one, but two potential presidential candidates making the trek. REINCE PRIEBUS, RNC CHAIRMAN: Back in Iowa. KARL: Texas senator Ted Cruz as well as Senator Rand Paul of Kentucky, not one, but two potential candidates for president. Cruz has been in the Senate a scant six and a half months, but he's already becoming a national figure. CRUZ: I'm holding in my hand a pistol grip. KARL: Fiery defender of guns and traditional marriage, unrelenting critic of abortion, the IRS, and President Obama. CRUZ: Jon, good to see you in Iowa. KARL: The next presidential election is nearly three and a half years away, but Senator Cruz's travel itinerary looks more like a presidential candidate than a freshman Senator. Early primary states New Hampshire, South Carolina, two trips to Iowa, also Georgia, New York, and Florida. What's going on here? Are you running for president? CRUZ: John, we are having a national debate about which direction the country should go. KARL: Understand the national debate. CRUZ: And what I am doing now is trying to participate in that national debate. I understand that everyone likes to focus on the politics. KARL: Last year, that was your first election you've ever won. First time ever. Are you ready to run for president? CRUZ: You know, I'm not focused on the politics. KARL: Is it fair to say you're not? CRUZ: John, I've been in the Senate all of seven months. The last office I was elected to was student council. So this has been a bit of a whirlwind. CRUZ: My mother was born in Wilmington, Delaware. She is a U.S. citizen. So I am a U.S. citizen by birth. KARL: Cruz's confrontational style alienated members of both parties. UNIDENTIFIED MALE: Senator Cruz has gone over the line. KARL: Back in Washington, we asked him about that. It's no secret, you've rubbed a lot of your colleagues the wrong way, maybe even most of them, some would say. CRUZ: Well, I will leave that to others to share their views. I mean, I can tell you my focus from day one has been on substance and policy. It has been on going to the committees on which I serve, on trying to do the jobs -- I'm on the judiciary committee, so we had hearings on guns. I believe passionately in the second amendment right to keep and bear arms. And when the president used the tragic shooting in Connecticut as an excuse not to go after violent criminals, not to stop crime, but instead to push an anti-gun agenda, I wouldn't be doing my job representing the state of Texas, representing 26 million Texans, if I didn't come and stand up and fight for the second amendment. KARL: Do you think he was exploiting the tragedy which happened in Newtown? CRUZ: I think he had a political agenda, which was to restrict the second amendment right to keep and bear arms of law-abiding citizens. They took advantage of that horrible, tragic shooting to push that agenda. And they didn't focus actually on solving the problem. KARL: You have Republicans that wouldn't do anything with President Obama. I mean, Obama's kind of like, you know, he's enemy number one, he's the villain. How do we get anywhere if you've got Republicans that won't even talk about a deal with the president on something like the debt? CRUZ: See, I actually don't agree with the premise that have. I don't consider President Obama enemy number one. I think he is someone who believes passionately in his principles. And I respect him for that. KARL: You just said he was exploiting the Newtown shooting. CRUZ: Actually, you used that word. KARL: Well, you said he was using it was an excuse to pass a gun control, not that he was trying to protect kids (inaudible) how to do it. CRUZ: I think the policies he was advancing were wrong and dangerous. And the point that I was finishing, is I admire and respect him in that he fights for his principles, but I think his principles are profoundly dangerous. KARL: You have been called at various times a schoolyard bully, arrogant, a wacko bird. CRUZ: Look, I cannot control insults that others will choose to hurl. What I can control is that I have not and will not reciprocate. JON STEWART, HOST, DAILY SHOW: ...take our country back from the socialist Kenyan Tea Partier-type guy. CRUZ: I think Jon Stewart is a very funny guy. In fact, he called me a dirty syrup guzzler. KARL: Right, right, in reference to Canada. CRUZ: Which I'll confess I wasn't sure what that was, but I will tell you in response to that, I did send Jon Stewart a letter saying that I rarely guzzled syrup. But any time I did, it was Texas syrup. And sent a bottle of it, and invited him to syrup festival in the state of Texas. KARL: Did you hear back from him? CRUZ: We got a very nice phone call back. CRUZ: I think the biggest reason President Obama got elected in 2008 is Republicans lost their way. We weren't standing for principles. When you have a national debt that is larger than our entire economy -- the Democrats have driven that, but there are a whole lot of Republicans were complicit. And I think Americans are fed up politicians in both parties who are digging us deeper into debt and who are together disregarding the constitution. KARL: Because let's talk about immigration. We have seen poll after poll, latest ABC News poll, 55 percent of Americans say that they would -- they favor a path to citizenship for those that are here illegally. Are the majority of Americans wrong about this? CRUZ: You know, Jonathan, there is no stronger advocate of legal immigration in the U.S. Senate than I am. KARL: But you've got 11 million people here that are here undocumented immigrants, and you're saying that none of them should have a right, a path to become citizens. That's what you're saying. CRUZ: What I am saying is if you want to fix the problem, you've got to focus where there is agreement. The most divisive element of the gang of eight bill is that it grants amnesty. It grants a path to citizenship to those who are here illegally. KARL: And you are adamantly opposed to that. Am I right? I'm asking you. CRUZ: I think a path to citizenship for those who are here illegally is profoundly unfair to the millions of legal immigrants who followed the rules. KARL: Is immigration reform that includes a path to citizenship dead? CRUZ: I do not believe the House of Representatives will pass a path to citizenship. KARL: It's not going to happen? CRUZ: And I think the White House knows that. KARL: So Senator Rubio has led the charge on this. RUBIO: I know that we must solve this problem once and for all or it will only get worse. And it will only get harder to solve. CRUZ: Oh I don't know. Marco Rubio is a friend of mine. He's a good man. I like him, I respect him. And I think on immigration I think he proceeded in good faith. I think he believes in the Gang of 8 Bill. KARL: But you also think he's dead wrong on it. CRUZ: If the Gang of 8 Bill became the law, in another 10, 20 years, we wouldn't have 11 million people here illegally, we'd have 20 or 30 million. KARL: Senator Cruz is the son of a Cuban refugee who's story he often cites as proof the American Dream is real. KARL: Cruz himself has a resume that looks like anything but an outsider. Princeton graduate, Harvard Law degree and the first Hispanic to clerk for the Chief Justice of the Supreme Court. You've got an interesting background for a Senator. You argued a case before the Supreme Court at age 32. KARL: Scalia beat up on you too? CRUZ: Scalia, Ginsburg, the chief. It was 30 minutes of getting pounded. It was a head of tuna being thrown to a school of sharks. I will tell you, I have always liked the fact that I sit in my office and I look at a giant painting of me getting my tail whipped 9-0. And it is very good for instilling humility. To look and see, OK that's what it looks like to lose. KARL: Looking ahead to 2016, Cruz says Republicans must nominate an unapologetic conservative. In other words, somebody who's politics match his own. Nationally it looks really tough for Republicans. You've lost five out of the last six popular votes, presidential elections. Eighteen states and the District of Columbia have gone Democratic in all six of the last six Presidential races. That's 242 electoral votes. CRUZ: You know if you look at the last 40 years, a consistent pattern emerges. Anytime Republicans nominate a candidate for president who runs as a strong conservative, we win. And we nominate a moderate who doesn't run as a conservative, we lose. KARL: Back in Iowa, reports continue to pepper Cruz with questions about his presidential aspirations. Is he going to run? KARL: 160 words later, still no clear answer. REPORTER: Was that a no or a yes? STEPHANOPOULOS: Jon Karl sticks around to join the roundtable. They'll weigh in on Ted Cruz and Liz Cheney jumping into the Wyoming Senate race. And why we won't see her father on the campaign trail. CHENEY: Today I am launching my candidacy for the United States Senate. I'm running because I believe it is necessary for a new generation of leaders to step up to the plate. SEN. MICHAEL B. ENZI, R-WYO. : She said that if I ran she wouldn't. She announced 30 minutes after I did. More specifically, stated my intention. CHENEY: I think Senator Enzi may be confused. STEPHANOPOULOS: Liz Cheney sparking a little family fight in Wyoming. Let's talk about that on our roundtable. Joined again by Jon Karl along with Cokie Roberts, Matthew Dowd, Dana Perino from The Five on Fox News, Van Jones from CNN's Crossfire. And I do want to get to Liz Cheney. But let's begin Jon with Ted Cruz and the rush to Iowa. This weekend Rand Paul there as well. We saw the interview and whether they say yes or no now, we know they're laying the groundwork. STEPHANOPOULOS: What kind of impression did they make? KARL: The non-squish party. But George, the last time around, you had a lot of Republican candidates, not many of them that were particularly electable. This time around it's going to be a very crowded field. And you have a much less predictable situation. Let's face it, we knew basically that Mitt Romney was the front runner almost the entire primary process. Now you're going have, I think you're going to see Rubio on there, you could see Jeb Bush in there, you're going to see potentially Chris Christie, you could see governors like John Kasich, I think Paul Ryan's going to run. A much more crowded field and much less predictable. ROBERTS: And that's fun. Because the Republicans, we normally do have a front runner and know what's going to happen. And this is going to be an interesting one to watch. STEPHANOPOULOS: Well, there's no one to watch in line. ROBERTS: No, that's right. And they usually do the line about falling, Democrats fall in love, Republicans fall in line. But the, I think it's interesting that Ted Cruz seems to have just written off the Hispanic vote. He's decided that he's going to oppose immigration and there it goes. But he's clearly worried about the women's vote. And he's now, he and Rand Paul have joined with Senator Gillibrand on the sexual assault in the military bill. And that is a funny place for him to be. Because it's basically saying take away the chain of command. KARL: In opposition to most of the Republican leadership and most of the other conservatives. ROBERTS: And other Demo-- and older Democrats as well. This is generational to some degree. But it's also a place where he's clearly going. STEPHANOPOULOS: And Matthew Dowd, you're from Texas, you also work with the Senator on the Bush campaign. DOWD: In the first campaign in '99, 2000. Ted Cruz is a very smart guy, a very ambitious guy. I thought it was so telling Jon in your piece, one of the most telling things, that I learned about Ted Cruz in that work and what came out across in your piece is when he's looking at a painting of himself before the Supreme Court. And he says, I look at this painting of myself before the Supreme Court and I'm humbled by it. STEPHANOPOULOS: He is maybe running for President. DOWD: Yeah. I think the thing Ted Cruz has to be careful of is, as I listen to that interview is two things, first obviously Barack Obama running for president, basically having not served in the U.S. Senate for three years or whatever the (inaudible) was. He set a standard, that actually, ironically Republicans totally criticized, how can he run, how can run? He's not experienced enough and all that. He's got to be careful about being in too much of a hurry. Sometimes being in a hurry gets you a place faster, but sometimes being in a hurry gets you in an accident. The other thing, the other thing George, I think is he mentioned like Republicans win when they run as conservatives. Actually if you think about when people win for president, what they are, they can be a certain ideology, they could be more liberal like Barack Obama or more conservative like George Bush or Ronald Reagan, but they always know how to speak to the middle. And I have not seen any evidence that Ted Cruz really knows how to speak to the middle of the country. You have to be able to speak to the middle of the country in order to get elected. STEPHANOPOULOS: Dana you're nodding your head. PERINO: I think that's probably, well it's not probably. (inaudible) I think Ted Cruz is an excellent national politician. He's also a very good retail politician, so that's good. Going to Iowa keeps his name in the paper and also keeps him having a national profile for some big pieces of legislation that are coming down the pike. One of the questions I will be looking to see answered is on the fund raising piece. Can he turn that kind of national attention into something where you start to raise a lot of money? Because by next February even though it feels very early to us to talk about 2016, if you have to raise about $1 billion to run for president in 2016, you're going to have to start pretty early, start banking that money right away. ROBERTS: Well Texas is good for that though. I mean being from Texas helps. PERINO: I'll say that what he was trying to say, the reason he has that painting up there is that he know that you can give it your all but you can still lose 9-0 in the Supreme Court. And that is humbling. DOWD: I think he was trying to say something more. STEPHANOPOULOS: On the Republican side it's wide open. So many people going in there. Do you think the prospect of Hillary Clinton with Joe Biden right behind her, squashes all wannabes on the Democratic side? JONES: It probably does. But I think it's much more interesting to watch the Republicans because, I love it, I love it. ROBERTS: And so do the Democrats. JONES: (inaudible) But the problem is they have Districts that don't look like America at all. Which means that a lot, for their Congressional rhetoric and their Congressional strategy being so hard on immigration. Where, it's not really where the middle of the country is anymore. I think their Congressional strategy is making it hard for them to run for the president. And Marco Rubio. Marco Rubio. As long as you keep showing Ted Cruz every Democrat is happy. Because Marco Rubio is the one we're most afraid of and he's just been given a sharp elbow by Ted Cruz and by his fellow Republicans. DOWD: And we say Republicans are this and this, in the end, Republicans want to win. Republicans want to win the presidency back and most of the time they nominate a conservative, but a conservative who can speak broadly and deeply to the values of the country. JONES: Ted Cruz cannot do that. If you listen to Ted Cruz you do not hear somebody, if you're a moderate, if you're a liberal, you hear a strident ideologue. And I don't think that's going to work. ROBERTS: Speaking of Democrats though, Amy Klobuchar was also in Iowa wasn't she? KARL: Yeah and I would look for her. STEPHANOPOULOS: Wait and see what happens. KARL: On running depending on (inaudible). STEPHANOPOULOS: But back on the Republicans, you are seeing something interesting now happen in the Senate on a number of issues. Even though you have this polarization, you talked about. Van in the last week we've seen bipartisan coalitions come together to figure out a way to get more of the President's appointments. We see this bipartisan coalition on immigration, on student loans. ROBERTS: Interesting led by McCain and Schumer in most cases. I mean Chuck Schumer has turned out to be the bipartisan guy. STEPHANOPOULOS: On the Democratic side. But a lot of Republicans Dana now trying to say, wait we do want to get something done. PERINO: Well I think that's true. I don't think that people run for office to be obstructionist. I do think they want good policy. The interesting thing on the student loan piece that I think the media just blew right past, was that the Republicans actually came to President Obama's side and said, OK here's the compromise. It was more the left wing Democrats in the Senate who are holding all of that up. To show the President Obama still has some sway with them, because he had a meeting with them on Tuesday night down at the White House and told the Senate Democrats, get this together and get this behind us. Guess what they did the next day? They got (inaudible). PERINO: It was more with Democrats that with Republicans. DOWD: I disagree on part of that. I think both sides are complicit in drawing districts. Democrats want to draw districts that they're safe in, Republicans want to draw districts that they're safe in, whether it's in California or Texas. They're both complicit in this and I don't think it's good for the democracy of the country. The Senate is still different. The Senate you get elected statewide. You have to appeal to a broader constituency in most places. And I think Cokie's right, Republicans know if they get so far out on this in the right it's an obstruction, they can't win the Senate. STEPHANOPOULOS: We're going to get to that in a second. KARL: This deal they did on nominations, this was a complete cave-in by Republicans. KARL: This was, look, Republicans have spent two years blocking the nomination of Richard Cordray to run that Consumer Protection Bureau. They were adamant that this was not going to happen unless there were changes to the law, changes to how that bureau was put together. And they, one, I mean Harry Reid promised to go nuclear, they really thought he was going to do it. PERINO: They wanted two of those nominees, the ones that were considered illegal appointees. They wanted them pulled. They got those two pulled. PERINO: And if for every compromise you define it as a loss for yourselves, then you're always going to be losing in America. ROBERTS: That's right. That's exactly right. PERINO: You can't always define compromise as a loss. KARL: Gee the White House a month ago had no idea, if I had said to Senior White House officials, look you're going to get Cordray, you're not going to have to make a single change, they would have said, no way. JONES: That's a fig leaf. I do think it's sad though that we have this incredible backlog of judicial appointments. That is not moving at all. PERINO: Same was true during the Bush administration. JONES: Statistically it's actually worse. PERINO: No, it's actually not. JONES: We can argue about it. But I think it's bad for the country. JONES: I actually want to talk about Liz Cheney because this whole view that obstructionism is something that we're beginning to move past, she actually has said that she thinks it's the height of patriotism, to actually obstruct. STEPHANOPOULOS: You see a similar dynamic here. You see a lot of the Republican establishment in Washington and in the state of Wyoming, rising up against her. ROBERTS: Well some of that is to support Enzi, Senator Enzi. They feel like it was an insult to him and he's somebody they know and like and so there's that. JONES: But also the people in Wyoming apparently don't like it very much either if you look at the polling data. But here's what's interesting to me, I've watched Liz Cheney. I don't think she's big on potholes in Wyoming. I don't think this about the people of Wyoming. I don't think she's about the Republican Party that much because she's going to get a net zero increase in Republicans if she wins. I think she's running for president. I think this is about the Cheney brand. I think she's running for president in 2020. And I hope the people in Wyoming have enough sense to know when they're being used. STEPHANOPOULOS: Jon Karl you were actually out there in Wyoming. KARL: Yeah I actually went to a rodeo with Liz Cheney when I was out there to interview her father. And look, I'd say don't, don't underestimate her. This is a really tough race George. ROBERTS: He's there every weekend. KARL: Enzi, Enzi never went Washington. This is going to be a very tough race. And she made it very clear, her father is not going to be out on the campaign trail with her. She wants to prove she can win this on her own. And that's going to be tough. DOWD: Senator Enzi is not Senator Lugar. DOWD: Senator Enzi is the 9th most ideological conservative senator in the Senate. So it's not, it's like how she's going to run from the right on that. And she's making allusions to, sort of, he's too old, or he's been there too long, or he compromises too much. He doesn't compromise that much at all. DOWD: The difference in Wyoming, the people in Wyoming, I've been there a lot. I know Liz, I think she's very talented, very smart, very bright. ROBERTS: I like her a lot. STEPHANOPOULOS: And she jumped the line. ROBERTS: She jumped the line. PERINO: (inaudible) growing up there. So I talked to my Aunt Patty Sue runs Memory Lanes Bowling Alley in Rawlins, Wyoming. I have other family there that are building businesses and trying to make a living that way. And I assumed that she would say something along the lines of, well we like Liz Cheney but you know, let, she should wait her turn. Let's just see how it goes. I was surprised, my Aunt said, you know, the Senate doesn't come with a lifetime guarantee. PERINO: And I would take a listen to Liz Cheney. So I think the Republicans might actually be more willing at least to hear her out. ROBERTS: This week George another Congressional Senator daughter is going to announce, Michelle Nunn in Georgia. And she is a very different kind of breed there. Because she's been in Atlanta for years and years and years working with the with the people on all kinds of issues. STEPHANOPOULOS: And Nunn is an amazing name in Georgia. ROBERTS: So it's a different approach to coming into public service. STEPHANOPOULOS: We're just about out of time. We have less than a minute left. But didn't want to leave without remembering Helen Thomas, Dean of the White House Press Corp for so long. Started with President Kennedy, ten presidents, she was in the first row asking very tough questions. Dana Perino, I know you were in the same position I was. I remember my first White House briefing. They would not let me go, she would not let me off the hook, I admired her tenacity and her passion. And she really did bring that commitment to work every day. PERINO: Yeah we would call on her in the front row. She's the only reporter to ever earn her own name on a seat in the Briefing Room. You call like, sigh, Helen? You knew something was going to come up that you were either going to be angry about or frustrated with. I only lost my temper with her once, I liked her very much. My first day that I ever did a briefing, the TV briefing, she came up to me afterwards and could not have been more encouraging to me. And said that she thought I was very trustworthy. And I worked really hard not to lose that. ROBERTS: She was very encouraging to young women journalists. ROBERTS: And they flocked around her as a hero because she really did try to smooth their path. KARL: She could be wickedly funny too. PERINO: Yeah she had a great, contagious laugh. She made a lot of, she made people very frustrated. STEPHANOPOULOS: An amazing (inaudible), we've got to go. We'll be right back. STEPHANOPOULOS: In our Sunday Spotlight, Netflix surprised Hollywood this 14 Emmy nominations for hits like "House of Cards" and "Arrested Development." And the buzz has already begun for next year thanks to "Orange is the New Black," their new series based on the book by Piper Kerman. It's an up close and personal look at her year in prison and Dan Harris spoke to Kerman about the human story she found behind bars. UNIDENTIFIED FEMALE: What'd you do? UNIDENTIFIED MALE: Aren't you not supposed to ask that question? I read that you're not supposed to ask that. UNIDENTIFIED FEMALE: You read that? You even studied for prison? HARRIS: "Orange is the New Black" is the rapturously reviewed new TV show from Netflix about a successful, suburban-bred woman who ends up in prison. It is based on a memoir of the same name, written by this woman, Piper Kerman. When you walked in with your blonde hair and your pretty fancy background, did you get some cockeyed looks? KERMAN: When I walked into prison gates, I was frightened. But the last thing I expected was for kindnesses to be extended to me by the other prisoners. But that was exactly what I found. HARRIS: Kerman's legal problems started when she was fresh out of college in the early '90s. KERMAN: I met and became involved in a relationship with what seemed like an incredibly glamorous and sophisticated older woman. And she was involved with narcotics trafficking. And at her request, I carried a bag full of drug money from Chicago to Brussels. And really frightened myself. HARRIS: She left her girlfriend, moved to New York and moved in with her new boyfriend Larry. But many years later as depicted in the show, the law caught up with her. UNIDENTIFIED MALE: I feel like I'm in a "Bourne" movie. Have you killed? HARRIS: The show takes artistic liberties with Kerman's story, but some of the scenes are straight out of her real life. UNIDENTIFIED MALE: These are kind of like Toms. UNIDENTIFIED MALE: How nice. Strip. KERMAN: Absolutely, the female officer who processed me, I think just went to great lengths to be as scary as possible. HARRIS: Kerman says she's proud that this show humanizes prisoners. UNIDENTIFIED FEMALE: I'm going to call you Dandelion. HARRIS: She says she hopes it will make viewers think twice about the social and financial costs of maintaining our vast archipelago of prisons and jails. KERMAN: Incarceration does not rehabilitate people. And it doesn't allow them to change their lives. HARRIS: So are you saying that we shouldn't lock people up? KERMAN: I'm saying that I think that non-violent, low-level offenders can be dealt with in much more sensible ways than by incarceration. A different punishment might have been more suitable for me. HARRIS: Kerman ultimately served 13 months behind bars. Her boyfriend, who proposed right before she went in, stood by her. UNIDENTIFIED MALE: That's a yes right? KERMAN: You know we live a very settled existence these days. HARRIS: A happy ending for her. But Kerman who today helps newly released inmates through a group called the Women's Prison Association, is aware that she had advantages many others do not. A problem she hopes this new show, in some small way at least, might be able to address. For "This Week" Dan Harris, ABC News, New York. STEPHANOPOULOS: Fascinating show, thanks to Dan Harris for that. Thanks to everyone here on our roundtable for a great discussion. And now we honor our fellow Americans who serve and sacrifice. And that is all for us today. Thanks for sharing part of your Sunday with us. Check out "World News with David Muir" tonight and I'll see you tomorrow on "GMA."